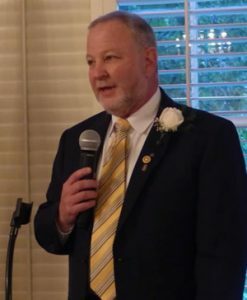 Last night the Rotary Club of Trenton Installation Dinner was very different from the past. Our new President, Hal Levenson, is a 30 year member with a new vision for the future. However, anyone who knows Hal immediately understands that he loves to joke. Yes, he can dish it out, but he also takes his ribbing in good nature…a sport. The Trenton Country Club was packed with members and guests who lined up eagerly to get in a hilarious cheap shot at Hal…a roast, all in good fun. When the humor subsided, Hal gave a poignant reminder of the wonderful work we have done in the past and challenged us to continue to be a powerful force for good in the Trenton Community in the coming year. The evening was filled with both hilarity and commitment. We all wish you luck Hal and pledge our support to your expanded aspirations. Outgoing President Bill Cleave thanks members of his board for their service: (left to right) Bill Cleave, David Navazio, Hal Levenson, Charlie Parkerson, Kristy Bruce, Greg Caruso, Suzanne Price, Scott Harrah, Mike Tusay, Bud Gough.